The Bush administration didn't ease its hard-line tactics for interrogating terror suspects until after concerns were raised repeatedly by State Department and military officials worried about violating international and U.S. law, memos released by the White House show. Bush's order in February 2002 followed the advice of Justice Department lawyers who argued the conventions couldn't apply to an international terrorist group or militia members who did not follow the laws of war themselves. On the losing side of the argument: Secretary of State Colin Powell, who vigorously opposed carving out exceptions to the Geneva Conventions. Bush ordered that all prisoners be treated humanely and, "to the extent appropriate and consistent with military necessity," in line with the "principles" of the Geneva Conventions. But at the same time he reserved the right to suspend the conventions "in this or future conflicts." "Despite our best efforts, some detainees have tenaciously resisted our current interrogation methods," Hill wrote to Joint Chiefs of Staff Chairman Gen. Richard Myers on Oct. 25, 2002. However, he questioned the legality of some of the harshest interrogation techniques that were being proposed. "I am particularly troubled by the use of implied or expressed threats of death of the detainee or his family," he wrote. Despite a report Monday by CBS News, one technique Rumsfeld did not approve involved pouring water over a prisoner to create the sensation of drowning. Six weeks after giving the go-ahead, Rumsfeld abruptly canceled his approval. A Pentagon statement said he had "learned of concerns" about them. Rumsfeld formed a panel of top Defense Department officials to develop guidance on what interrogation techniques should be allowed. "Should information regarding the use of more aggressive interrogation techniques than have been used traditionally by U.S. forces become public, it is likely to be exaggerated or distorted in the U.S. and international media accounts, and may produce an adverse effect on support for the war on terrorism," the panel wrote in its April 2003 report. Rumsfeld issued a new set of approved interrogation methods later that month. He allowed methods like "significantly increasing the fear level in a detainee" and "convincing the detainee that individuals from a country other than the United States are interrogating him." But he said all techniques must be "applied in a humane and lawful manner." 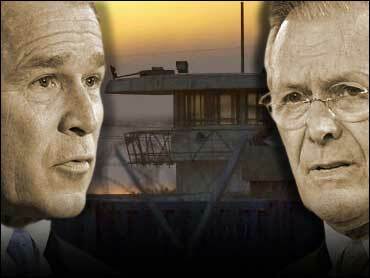 Mr. Bush and Rumsfeld have said the Geneva Conventions apply to all prisoners in Iraq. But Rumsfeld acknowledged last week that he ordered a suspected terrorist to be secretly held in Iraq without notifying the International Committee of the Red Cross, which is a violation of the Geneva Conventions. Rumsfeld said he approved an unspecified number of other, similar secret detentions.